My husband and I weren’t initially sure how we’d celebrate our 30th. 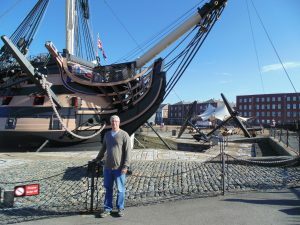 We decided to turn it into a history lover’s trip when he expressed a life long desire to tour the HMS Victory, Nelson’s flagship at Trafalgar. At first I thought “yawn,” then realized that Jane Austen sights abound in the English countryside, too. And then there was London, with all the beautiful museums. Here’s a little peek at our adventure, and a reminder that we don’t need to spend a lot of money to see the world–I saw so much of the world from romance novels starting when I was (too) young. I’ve no doubt that’s what got me interested in truly seeing the world, and led to my time in the U.S. Navy. Books change lives, indeed.